As I figure it, according to Alien BBQ's ratios, for a 24" square firebox, with a 4" sq. tube, you will have a stack that is too tall (sorry ). By his ratios, you will need to go with a 5" sq tube, or 5 3/4" dia. at 27" tall to get the drafting right (stack height 75% of cooking chamber length). And calculation says that a 24" square firebox is about 250% of the required box volume for the cook chamber volume. The calculator recommends 17 1/2" square, I'd just go 18" for the heck of it. Then it calcs a 3 1/4" sq tube stack at the required 27". OR, if you just want to stick with the 4" sq tube you have, I kept poking in numbers until I came up with 20 1/2" square firebox requires a 4" sq stack, 27" tall. still at 160% of recommended volume. And, if it turns out that "everyone" else is right, well, just cook 'em an apology brisket or pulled pork. Those taste better than crow anyway! First off, thanks for all of the help. I makes things much smoother for the rest of us when someone that has been through the process is willing to help out. Now, I have a 24" (diameter) x 36" (length) grill and I'm adding a firebox to it. The box is a 24" X 24" square and if I entered everything correctly, it needs a chimney volume of 619.20 cubic inches. I'm adding on to the existing 4" x 4" exhaust so if I followed you example correctly, I need a 38.7" length of square tubing for the exhaust. The only problem I'm having is that everyone that comes by keeps telling me the stack it too tall. Would you please verify my numbers so I can just kick these people out of my backyard once and for all? EDIT: I see Tom C beat me to the reply!!! Thanks again for all of the help. By the time I discovered you guys and the calculator, the firebox was way under construction and too late to turn back. I kept the 24"x24" firebox and ended up with a 4"x6" chimney at 29". I broke it in on Saturday and everything went great. Since it was my first smoke ever, I couldn't even wait to get paint on it before trying it out. I added a few chunks of lump charcoal and two splits of hickory every hour and the temp stayed between 220 and 230 all day. I was expecting to have some problems being my first attempt but I was amazed at how sensetive the pit was to the air intake. A slight adjustment one way or the other and the temp gauge would respond right away. Thanks again! Sounds like everything worked out great! Glad the calculator helped you get it right. Of course the main thinks too should go to Tom C & Alien BBQ for coming up with the ratios to begin with. I just polished the final product from there. The smoker looks great! I too was surprised on how much control I get form adjusting the air intake. Once you get used to your pit you can really nail the temps you want. Congrats! Finally got to check it out, looks great! I bet the briksets looked even better! ok hopefully this is a simple and quick question and doesn't make me look like an idiot . 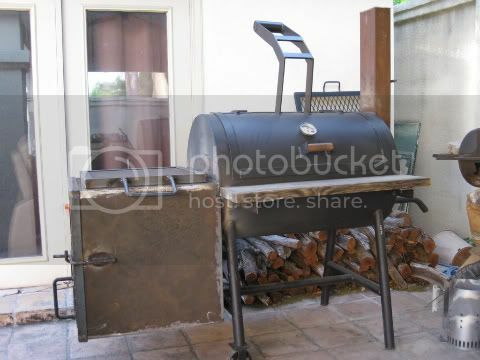 Is the calculator mostly ment for use with offset smoker designs or can the same principles be used for a verticle water smoker with the firebox directly below the cooking chamber? I entered all the numbers for such and it seems to work out except when it comes to the flue. For the smoker I'm designing (21x21x42 cooking chamber with a 21x21x16 firebox) I would need 2 -5" flues at 10" long. The thing that has me confused is most verticle box smokers I've seen usually only have a single flue 4 to 5 inches in diameter and maybe 6 to 8" tall. Also is there any serious down side to having a larger fire box? The calculator recommends a 7414 cu in fire box. Mine is 8232 cu in. Will an extra 800 cu in of space effect it adversely? Vertical smokers are a bit different in regards to smoke stacks. I would think that as long as you have a good air intake size on the firebox that you could get away with a 3" dia. pipe just a few inches tall for the exhaust. Put a damper on top of that for air control and I would think you would be fine. But, keep in mind I'm no expert on vertical smokers by any means. As for firebox size, yes, bigger is okay. You just don�t want to be too small. Anyone have an idea what I might be doing wrong? I tried to use the calc. last night, but it wouldn't let me enter any numbers. Thanks in advance. If you downloaded the file your system might have made it a read only file. Right click on the file and click on properties and uncheck read only. I am using the calculator for my current build. I would like to suggest adding one thing to the calculator. It would be helpful to guys building these if there was a smoker door counterweight calculator on there also. You need to know three things to figure the forth out. Here are the four things, like I said, you need to know three of them. The example below, we are trying to figure out how high to mount the counterweights. Weight of door weight of door when open, this give you the number of inch lbs of torque it takes to open the door. Then take the the weight of the counterweights and divide the in lbs it takes to open the door by that. This will give you the number of inches you need for the tubing to mount the counterweight. Of course you want to add a inch here cause you want the counterweight to hold the door open. NOTE: the door open weight and length should be measured with the door in the position you want the door to be when it is where you want it to be when it is in the open position. 720"lbs / 60lbs=12" + 1" = 13"
Counterweight should be mounted 13" on the other side of hinge with door in the open position. If the surface of the door when in the open position is 2" away from hinge, the total length of the tubing should be 15". This probably doesn't make sense, I'm pretty tired. Famous for tough and dry Briskets, lookin to change that! That would be another useful tool for the calculator. If there is a structural engineer that wants to work up all the calculations, some of that could be setup on a page. A good balance would allow the weight of the door when closed hold itself closed, and when opened, would shift the CG to hold the door open when opened. So, calculating the counterweight weight, arm length, angle of attachment, etc would have to be accounted for. Sounds like you are headed in that direction, I've often thought about this myself, but haven't got to the point to start asking any of the engineers around the office. Most people could just wing it, but I would hate to have too much counterweight in the wrong orientation versus balancing it all out to make it an easy open/close setup. Probably wouldn't be a bad idea to be able to input all of the components of your cooker to get a trailer weight as well, for axle calculations. Wow that is some nice info and although I'm past the stages of building a smoker. I just had to check it out. Thanks Forkin Pork for the comments. The calculator was just my way of giving back to the group. Without the help from people on this site, my own smoker most likely wouldn't have worked as well. Even the calculator has evolved due to the comments people have made. I'm happy that it has helped others get their smokers up and running. Now I think it was your wood smoker I saw sometime back in here and I said I just have to make one. Well I haven't started yet, ( daugther gettin married 6 wks ) but I will start some. I just have to have one for sure. Well I have to tell ya, it's a lot of work but there is nothing like cooking on a smoker you made yourself! My family and I have really enjoyed having it. When you get to making your's feel free to ask if you have any questions. If I can't help, someone here can. Finally got back in town, so I have a chance to catch up here. I was reading the thread here: http://www.thesmokering.com/forum/viewtopic.php?t=39861 about calculating a circle sector, and calculating the reverse flow plate. I have PM'd for a copy, and will try to work that into the main SS. As I said in that thread also, I was thinking of calculating the chord areas to calc the amount of offset for a round firebox to round smoker so that the overlap of the two pipes would create the proper size opening from the firebox to cook chamber. May at a later time, continue with the weight calculations mentioned above, since that will come into play if the cooker is going on a trailer.